In August 2018, we Interviewed Shannon Thompson, owner and operator of Brave Meadows Therapeutic Riding Center in Gray, GA. We learned that she had recently used maggot debridement therapy to help heal one of her therapy horse’s hooves, and we were intrigued at the intersection of two distinct types of biotherapy (Maggot therapy and Hippotherapy). Shannon was gracious enough to answer many questions, and we hope you will enjoy learning about her and Brave Meadows as much as we did! What led you to open Brave Meadows? I have always loved horses. I started horseback riding lessons when I was in fourth grade and continued for several years. While I was in high school and college, I began riding and showing Arabians for a few local farms. I was first introduced to hippotherapy when I was a senior in high school. 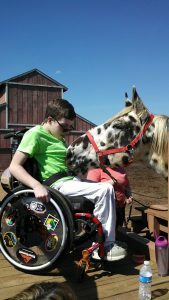 A friend of my mother’s asked to bring her daughter with cerebral palsy to the farm I rode at so her daughter could ride. The mother had been driving to a facility about 2 hours away for her daughter to ride and for the mother to learn more about hippotherapy. Hippotherapy was new to me and to most people in our area at that time. I would lead the horse around the arena while the mother would sit on the horse with her daughter. The child would use her trunk muscles while riding the horse because the horse’s movement mimics our walk. I remember the mother being so excited because her daughter soon was able to use her stomach muscles to lift her upper body off of the floor. It was amazing! After she stopped riding, it was about 15 years later before I even thought about therapeutic riding again. I had a friend teaching therapeutic riding lessons and I was interested in learning more about it. I have an uncle who has Downs Syndrome and he has always been the heart of our family, so people with special needs have always had a special place in my heart. I clearly remember the day it all began. I was giving a lady named Nancy a riding lesson and we were talking about therapeutic riding lessons. I told her I would love to begin giving special needs children and adults riding lessons and she offered to help me get the nonprofit business started so I could apply for grants and get donations. We received our nonprofit status in May 2005. I slowly began having special needs riders come ride on Saturdays. We grow more every year and now have special needs groups from public schools come during the school year and summer. How did you choose the name Brave Meadows? The first farm I owned was on a dirt road out in the middle of nowhere. I found out that the former Boston Braves (now the Atlanta Braves) used to hold their spring practices about ¼ mile from where we lived. The land we owned was at one time an apple orchard and the name had “Meadows” in it. So I just came up with Brave Meadows Therapeutic Riding Center. We are at a new location but the farm name is the same. The name is a unique name and very fitting since many of our riders have to be “brave” to climb aboard a horse and trust the animal and our volunteers. What are some of the challenges you/Brave Meadows have faced? I would say the two most difficult challenges we face on an ongoing basis are finding volunteers and monetary donations. We have a few volunteers who have been donating their free time for four or more years. Volunteers are the backbone of our facility and we could not make it without them. We need volunteers for side walking and leading the horses during therapy. We also need volunteers for fundraising and helping care for our horses. The number one challenge is finding grants and donations. I teach full time and am the one who has to constantly find money for horse feed, hay, farrier expenses, veterinary care, therapy equipment, and barn maintenance. It is not easy to stay afloat because many of our riders cannot afford the $35 riding session fee because they already have medical bills. I do not have a way to bill insurance so I try to keep the lesson fee very low. I never turn anyone away if they are not able to pay the $35 lesson fee. I usually only receive small local grants that are about $2,000 to $3,000 a few times a year. It costs a lot to care for our horses and we are always in need of monetary donations. It took us seven years to raise the money to put in a restroom at the barn, but we finally were able to put one in. We have a lot of patience and are very appreciative for whatever we receive. One of our future wishes is to somehow find a way to raise money for a covered arena. We have many riders who medically cannot be in the direct sun or stand the Georgia heat. Our arena has absolutely no shade and so we hope to one day find a donor willing to help us with a simple cover for our arena so our riders can ride despite the hot temperatures in spring and summer. Can you share any success stories or memorable moments in Brave Meadows History? We have been so fortunate to see many of our riders benefit from the services we offer. We have had a ten year old autistic rider who would only ride for maybe five minutes when he began riding. After six months of encouragement, lots of patience, and many praises, this young man was riding for 25 minutes and preparing for the Special Olympics. He was so proud of himself when he won a gold medal at the Olympics. This child wasn’t able to ride his bicycle without training wheels before he began riding horses, but after about a year of riding horses his training wheels came off. His physical therapists credit riding horses and building his trunk control and balance to being successful on his bicycle. He was so proud of himself! Our latest success story is a thirty-five year old woman who lost both of her legs because of diabetes. Her amputee doctor referred her to Brave Meadows because she has no balance with her new legs and is in a wheelchair. He sent her to ride horses to gain balance and build strength in her trunk so she can walk on her prosthetic legs. The first time she sat upon one of our horses named Chocolate Chips, she was petrified. It took four men to lift her from her wheelchair to Chips. She sat on Chips for maybe 5 minutes and was ready to get off. The next time she came out, she rode around the arena twice. She was so frightened but with lots of encouragement she exceeded her goal of once around the arena to two times. I cannot tell you how proud of herself she was after she dismounted Chocolate Chips. She was not able to ride the following week because she was in the hospital due to an infection, but we took the horse to the hospital to visit her. She, the doctors, and the nurses thoroughly enjoyed a little horse time and we put a smile on our rider’s face. That is what makes our day! Brave Meadows is about helping others. There are days when I do not know where I will get funding to feed the horses so I can continue our mission, but God always comes through. I am sometimes tired on therapy days, but when we see our riders’ smiles and success, it reminds my volunteers and myself why we do what we do. Brave Meadows is about helping others and seeing everyone succeed…even our volunteers. Can you share about your use of Maggot Debridement Therapy (MDT) for your horses? Recently, we had one of our therapy horses step on a nail. We had to take “Doc” to the University of Georgia Veterinary School to be treated. Doc had to have a small part of his coffin bone removed due to infection from the nail. The veterinarian recommended maggot therapy to eat the bad tissue and improve the healthy tissue in Doc’s hoof. They started with 1027 maggots and after nearly a week of letting the maggots do their job, Doc’s hoof had improved significantly. Doc was sent home with a couple of maggots still in his hoof. The veterinarians were very impressed and highly recommend using maggots to aid in healing. Doc has several special needs riders awaiting his recovery so they can prepare for Special Olympics. Thanks to the maggot therapy, his recovery should be sooner due to the larvae. What are your goals for Brave Meadows, and how can interested parties help support those goals?